Does your breaker panel contain out of date fuses? Are the breakers constantly tripping because of overloaded circuits? Or maybe you doubled up the breakers because you ran out of room for new ones? What about the wiring in the panel? Is it up to code? Some insurance companies may not cover your homeowner’s policy because the wire needs updating. Some homeowners don’t find this out until they are ready to sell their house. Or worse, when nearing closing. If you answered yes to any of these questions it may be time for a panel change. IMPORTANT: There were two popular brands of panels that were commonplace 30 to 40 years ago: Federal Pacific Electric (FPE) and Zinsco. Many contractors used either of these as their go-to choice. It has been proven that homes that have these panels have a risk of fire or an electrical hazard. It is also important to know that your insurance policy may not cover electrical fires due to a mismatch between a panel and breakers. Although many panels and breakers are interchangeable, only a qualified electrician should replace the breakers for safety and insurance reasons. Over the years, appliances have changed so much that their power consumption has grown significantly. Equipment that was used in the past typically cannot accommodate this increase in power usage which can cause problems from tripping breakers to safety hazards. The best way to prevent this is to have a new main circuit breaker panel installed. At DMS Electric, all of our installations are by the book and we will routinely work with inspectors to make sure your panel change will pass inspection. Today’s circuit breaker panels offer the convenience of additional space for new circuits and are made to adhere to the strictest regulations. Most modern panels have Ground-Fault and Arc-Fault protection that will give you additional safety should something go wrong. When it comes to your safety it is just not worth the risk to continue to use a potentially dangerous circuit panel box. 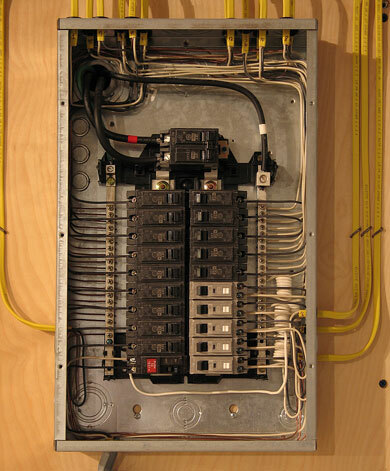 Call DMS Electric today at (215) 837-7959 for a consultation to replace your panel. It’s free and if you live in Philadelphia we can come out to give you a free estimate for the job.